One legal term of art the Supreme Court has never bothered to define with precision is the phrase “critical mass.” When the Court last upheld the use of affirmative action by colleges and universities in the admissions process, Justice Anthony Kennedy glossed over those words without really stopping to explain what they meant. Broadly defined, though, achieving a critical mass on campus means simply to assemble a diverse student body and let students reap the educational benefits that flow from that learning environment. So long as race is just one of many factors administrators weigh in deciding whom to admit, the Supreme Court has made clear, its consideration doesn’t run afoul of the Constitution. “It is the University’s ongoing obligation to engage in constant deliberation and continued reflection regarding its admis­sions policies,” Kennedy said in 2016’s Fisher v. University of Texas, the case that breathed life anew into race-sensitive admissions policies. But lower court judges know their place, and are aware that’s not how precedent works. In 2017, in pretrial proceedings, Burroughs dutifully rejected that argument and ruled for Harvard on that point, acknowledging that doing away with precedent is “something [she] decidedly cannot do.” Affirmative action, it’s fair to say, is not going anywhere under her watch. That’s Blum’s long game — to get Students for Fair Admissions v. Harvard, as the Boston case is known, all the way before Kavanaugh, who is nothing like Kennedy, and the newly reconstituted Supreme Court, which for the first time has five conservative votes to turn back the clock on a 40-year-old precedent that in many conservatives’ minds should have never happened: the 1978 decision that flat-out rejected racial quotas in higher education but blessed the limited use of race as a plus factor in college admissions. But before the case even gets to the justices, and in light of Burroughs’s preliminary rulings, Blum and his legal team have to pretend that this case isn’t about affirmative action. “The future of affirmative action is not on trial,” insisted Adam Mortara, one of the lawyers representing Students for Fair Admissions, during opening arguments earlier this week. That Mortara and three other lawyers on the anti-Harvard team are all former law clerks for Justice Clarence Thomas, who benefited from affirmative action but nonetheless despises it as a matter of constitutional law, only adds to the many ironies of the case. The case is farcical to the bone. Harvard, for one, is the institution Justice Lewis Powell praised as a model in his landmark opinion setting into motion our current affirmative action jurisprudence; to illustrate how much he endorsed Harvard’s methods, which he found “illuminating,” Powell even took the rare step of attaching Harvard’s admissions program as an appendix to his opinion. Blum, for his part, has never really cared about discrimination against people of color — his thing has always been reverse discrimination against white people. And yet here he’s relying on a group of aggrieved Asian-American plaintiffs who didn’t get admitted to Harvard, all of them recruited anonymously, to advance his own vision of a colorblind, race-neutral Constitution. A deeply reported New Yorker article on Blum’s efforts leaves little doubt that everything about his case against Harvard is but a conceit to attain his ultimate goal through nontraditional means. 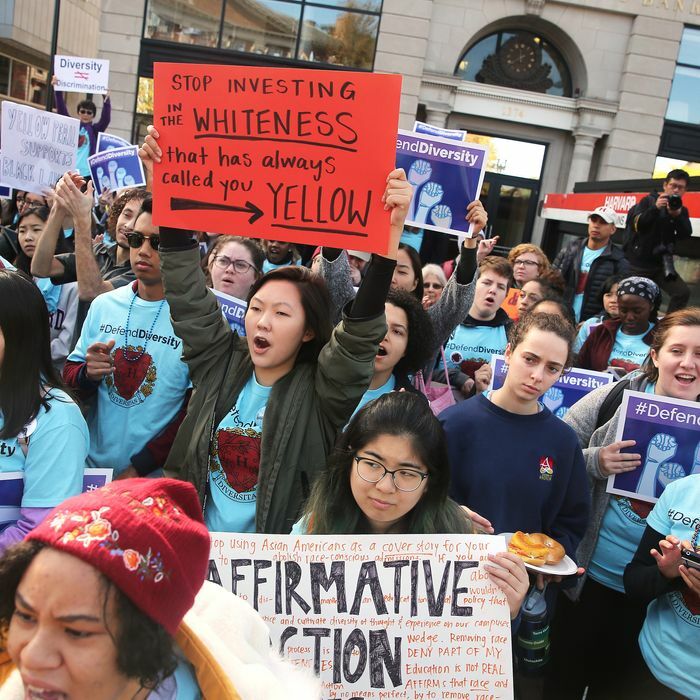 By seizing on the grievances of a small but vocal cadre of Asian-Americans, the vast majority of Chinese descent and recent immigrants, he has managed to pit a subset of one racial minority with its own history of discrimination — and on the whole largely supportive of affirmative action — against African-Americans and Latinos, who also support race-sensitive college admissions and have their own history of racial strife and disadvantage to show for it. The evil genius of this us-vs.-them scheme is that if it works, a minority within a minority will have undermined a historic civil-rights tool that for decades has increased educational opportunities for all minority groups. But that’s getting ahead of ourselves. Now that the trial is under way, the only question for Burroughs isn’t whether Harvard’s reliance on affirmative action is unconstitutional — it isn’t, and she has already ruled to that effect. It is, as Harvard law professor Jeannie Suk Gersen has explained, an entirely factual dispute about the extent to which Harvard and its officers took explicit steps to favor black, Latino, and white applicants to the detriment of Asian-American applicants with equal or better credentials — to achieve a kind of “racial balancing” that the Supreme Court has already said is constitutionally unacceptable. If the weight of the evidence points in that direction, that would be discrimination and Harvard would be in violation of federal law. Affirmative action may yet survive, but the unsavoriness of it all, on appeal, would give the likes of Brett Kavanaugh and Clarence Thomas and even John Roberts the cover they need to wring their hands and do away, once and for all, with the four-decade experiment of achieving a diverse student body to enrich the college experience.